Prangs, bangs and other mishaps. The French battleship Hoche was completed in 1890 with an elaborated superstructure such that she was nicknamed "Le Grand Hôtel". This photograph was taken after a refit during which the secondary armament was reduced to twelve guns and a lighter pole mast fitted aft. 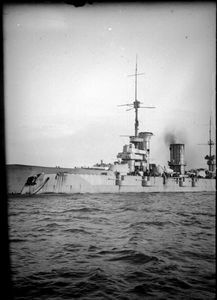 Nevertheless, top heavy and with two big 34cm guns fore and aft, even in a calm sea as in this photograph, the ship would pitch such that the foredeck became awash with the consequent flooding below decks. 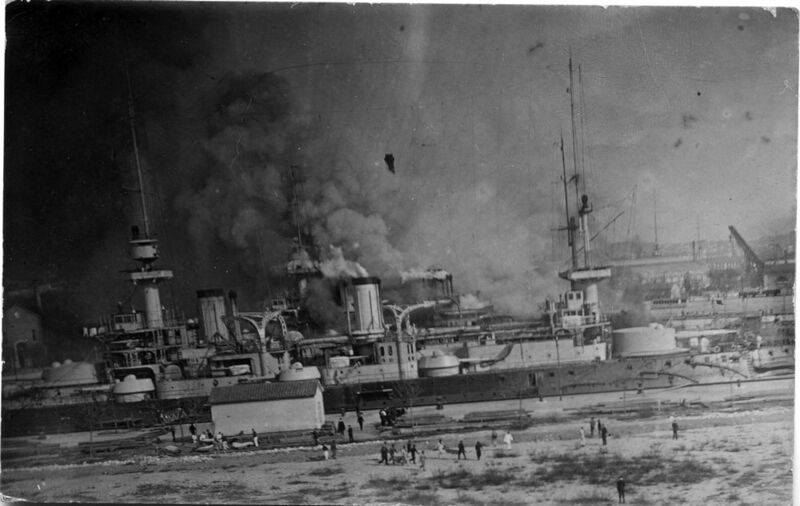 The battleship Iéna was destroyed by a magazine explosion whilst in dry dock at Toulon. Impure nitrocellulose propellant became unstable and spontaneous combustion in the magazines was the cause of two disasters - Iéna, 1907 and Liberté, 1911. 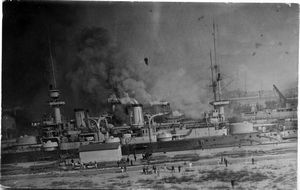 In this photograph, Iéna can be seen on fire behind the battleship Suffren, with, in the foreground, stretcher parties evacuating the dead and injured. 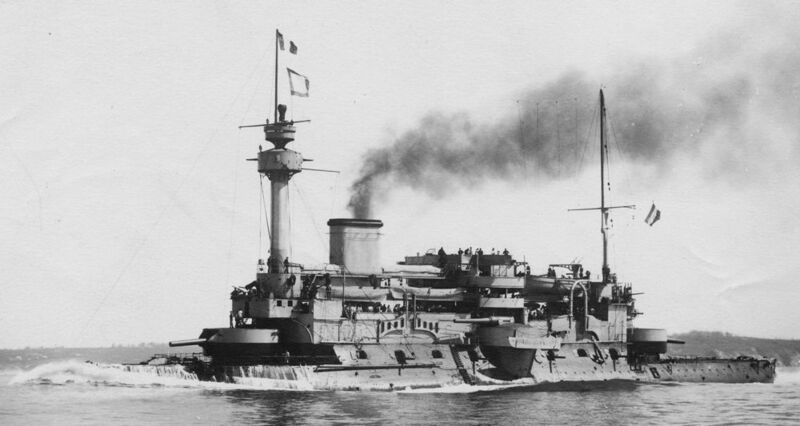 Whilst navigating amongst the numerous islands of the Chusan archipel, South of Shanghai, the French armoured cruiser Chanzy (commissioned 1894)ran agound in fog. The German gunboat SMS Luchs went to assist but the help was declined. 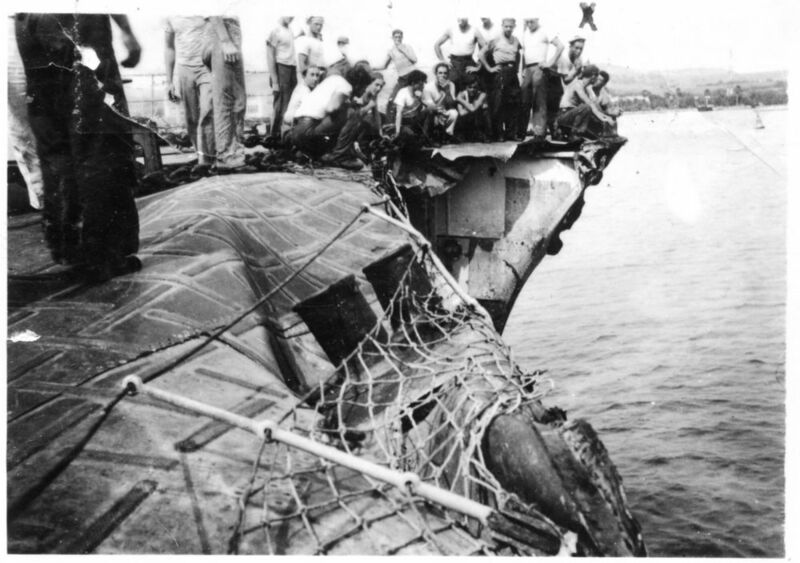 Unable to be refloated and with the crew taken off, the ship broke up. The French ship Duguay-Trouin, ex-Tonkin, had a chequered career. 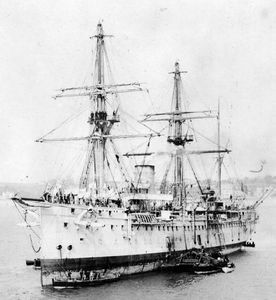 Launched as the hospital ship Tonkin, she was renamed Duguay-Trouin in 1900 and became a training ship, troopship and again a hospital ship. It was during a training cruise that she went aground off Saint Jean de Luz in 1903. We can see the barges port and starboard used to float the ship off the seabed. This French Avenger from the 6F squadron has ditched not too far away from help because someone has had the time to take a photograph. 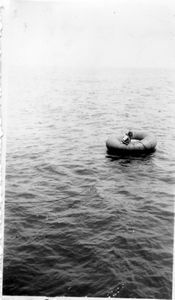 The three crew members are out of the aircraft which is still afloat and one of them seems to be holding something - an inflatable dingy? This squadron was based at Oran and was equipped with Avengers from 1952 to 1959. H.M.S. Renown in dry dock, 1935. During a manoeuvre with H.M.S. 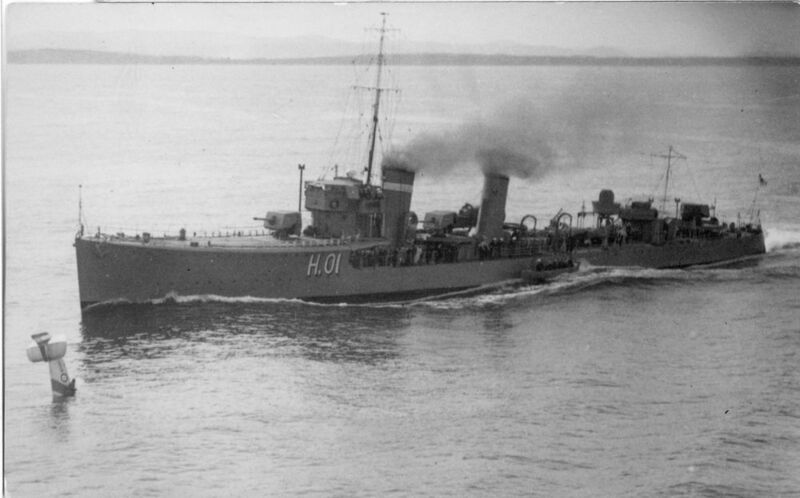 Hood in January 1935, H.M.S. Renown hit Hood on the port quarter. 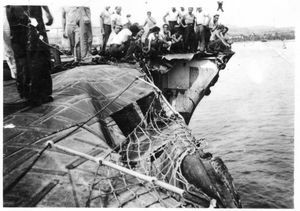 The consequences of the collision went much further than repairing decking, hull plating and screws. It was a classic case of imprecise and unclear signals from Rear-Admiral Bailey with lack of initiative by Captain Tower on board Hood and ill judgement on behalf of Captain Sawbridge of Renown (sounds a lot like the Camperdown/Victoria collision of June 1893). 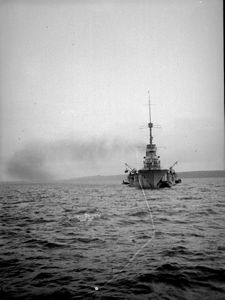 Coming in the wake of the Invergordon mutiny of September 1931 (in which the crew of Hood took on a less enthusiastic attitude and were reproached for this by the more mutinous crews of the Battle Cruiser Squadron), ill-feeling between the two ships was rife. Following a court martial, Sawbridge was dismissed from the command of his ship but Bailey and Tower were acquitted. 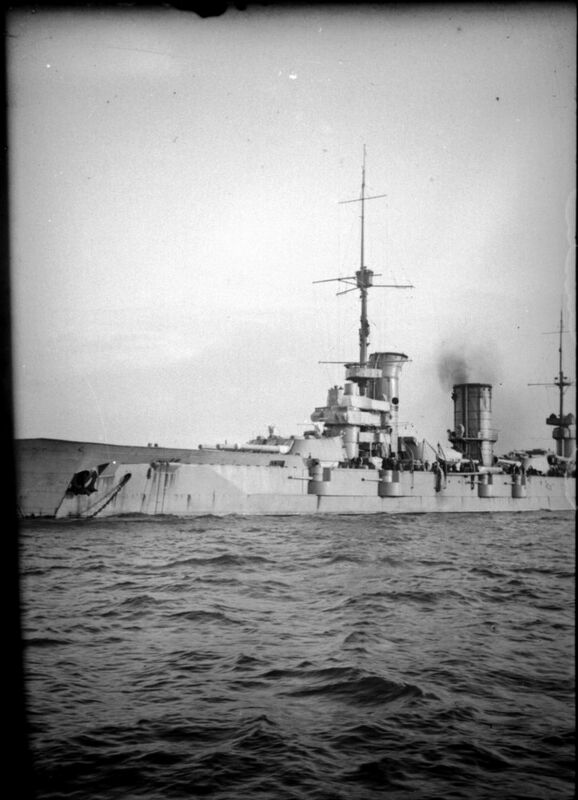 Three weeks later, the Admiralty changed the decisions of the court martial, attributing part of the blame to Bailey as he was responsible for the signals that led to the collision, Tower was blamed for not taking avoiding action soon enough and Sawbridge was still considered guilty but his sentence was reduced to a severe reprimand and he resumed command of his ship. The good relationship within the Battle Cruiser Squadron, so carefully built-up by Rear-Admiral James after the mutiny, was destroyed. Rear-Admiral James has suggested that Bailey did not like Sawbridge and the collision and ensuing attribution of blame enhanced this animosity which spread to the officers and men of the two ships. Verso: "A collision between the Renown and the Hood. H.M.S. 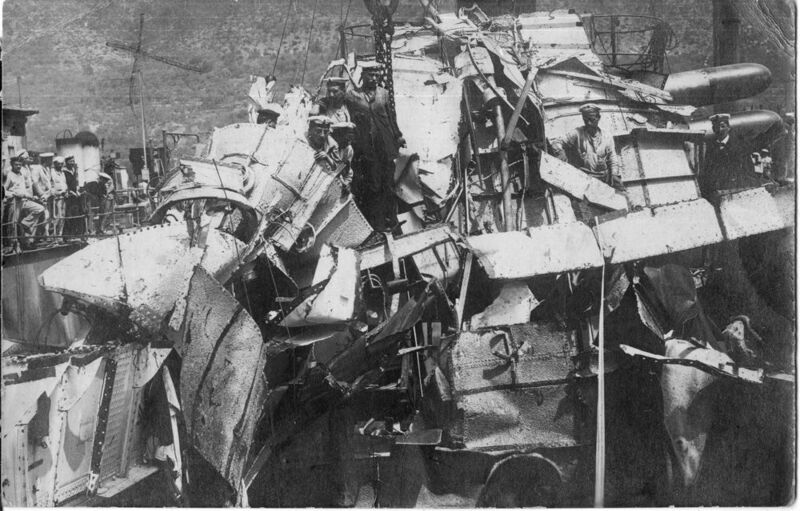 Renown, which was heavily damaged in a collision with H.M.S. 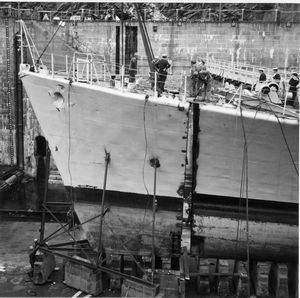 Hood, is in dry dock at Portsmouth where the necessary repairs will be made. Several officers were brought before a court martial." in French. This photograph maybe of the Laforey class destroyer H.M.S. Laurel, completed in 1914. During a patrol of the Heligoland Blight in 1914, along with other destroyers she engaged enemy forces and was greatly damaged, receiving four hits of which one enemy shell struck the fore funnel and exploded inside causing a fire in No. 1 boiler room. 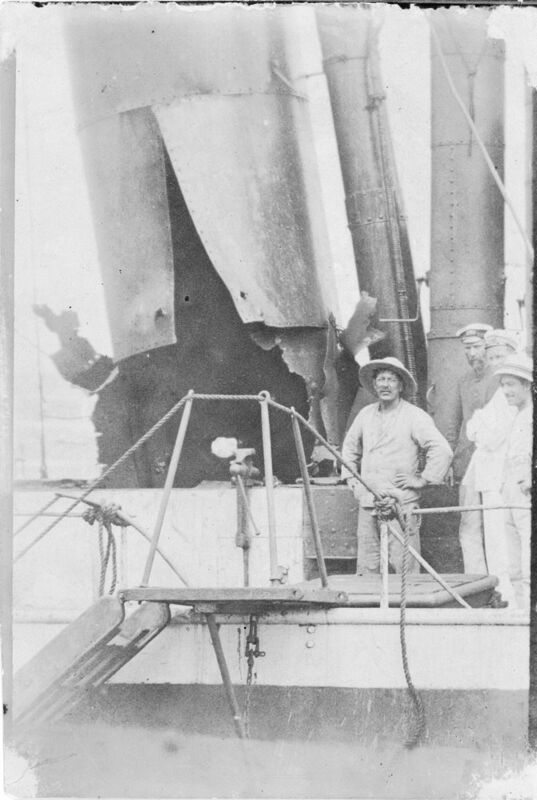 Here we can see the damaged fore funnel, steam pipe and base of mast with crew members wearing Sennet hats (discontinued in 1921). Given the text that accompanied this photograph, it is surprising the Admiralty illustrated a successful operation with a photograph of a bad landing. 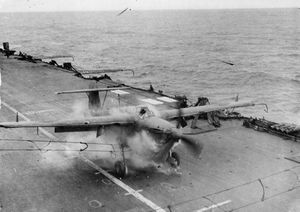 In fact, the repeated attempts by the Fleet Air Arm to damage and sink the Tirpitz using the Barracuda underlined the inadequacy of this aircraft - too slow and an insufficient bomb load - to make a sufficiently destructive attack. The text states that the aircraft was involved in "another successful Fleet Air Arm operation against the German battleship Tirpitz ", one of the series of attacks made at the end of August 1944. However, analysis of Ultra signals intelligence showed that Tirpitz had not sustained any significant damage during these attacks. Tirpitz was eventually destroyed by three hits with 5,400kg Tallboy bombs. Verso: "The Fleet Air Arm strikes Tirpitz. On board a Royal Navy aircraft carrier during another successful Fleet Air Arm operation against the German battleship Tirpitz and enemy shipping off Norway." "Picture shows;- A Barracuda makes a bad landing and hits the crash barrier. 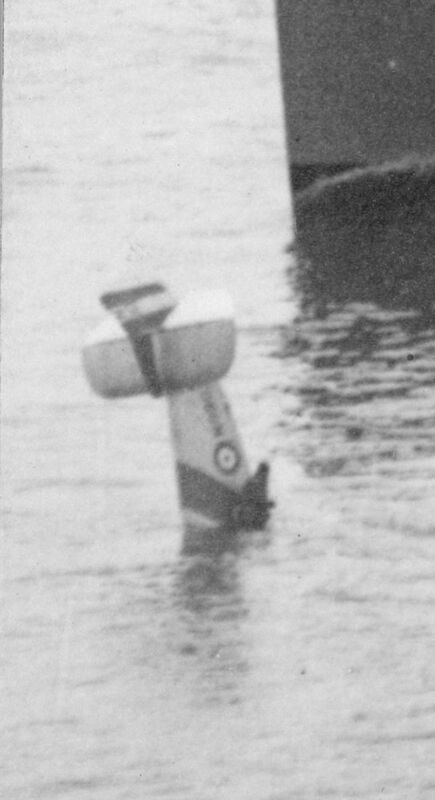 Bits of the propeller can be seen flying in the air. No one was injured." "Must not be published before Sunday papers of September 10th 1944." Picking up a ditched pilot. The destroyer H.M.S. Tyrian is coming up fast to reach the ditched aircraft and the ship's boat is ready to be released from the falls to go and pick up the pilot. It must have been quite an art to lower the boat and get it away whilst the ship was moving fast. Tyrian, one of the numerous modified Trenchant class/S class destroyers, was completed in 1919 and sold in 1930. This class in general was fast and even after war service, Tyrian reached almost 40 kts on the measured mile and averaged just under 39.5kts over four hours steaming. Verso: "Tarjeto postal. Union postale universelle. Espana." Detail: Picking up a ditched pilot. Detail. The pilot can be seen standing on the submerged wing waiting to be picked up. The aircraft looks very much like a Fairey III mk1. 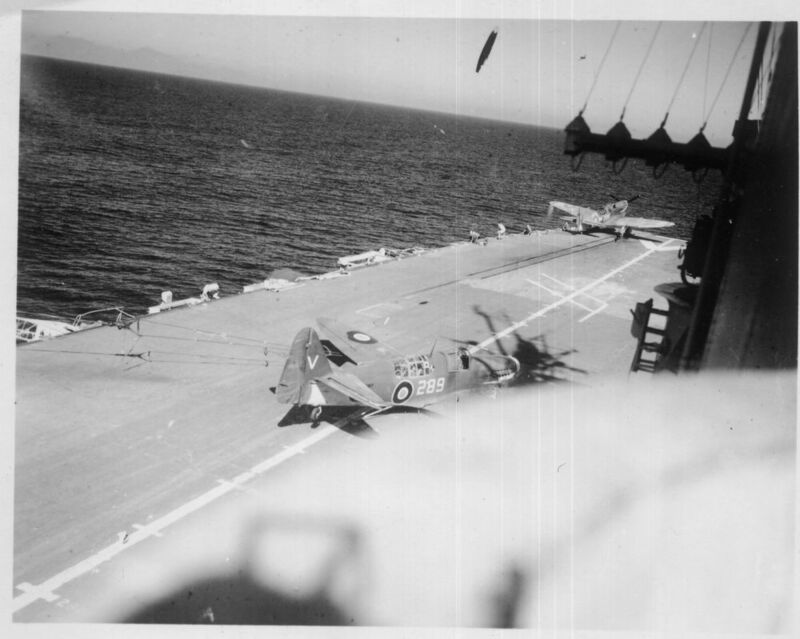 This accident may have occurred whilst Tyrian was on exercise with a carrier off the coast Spain. 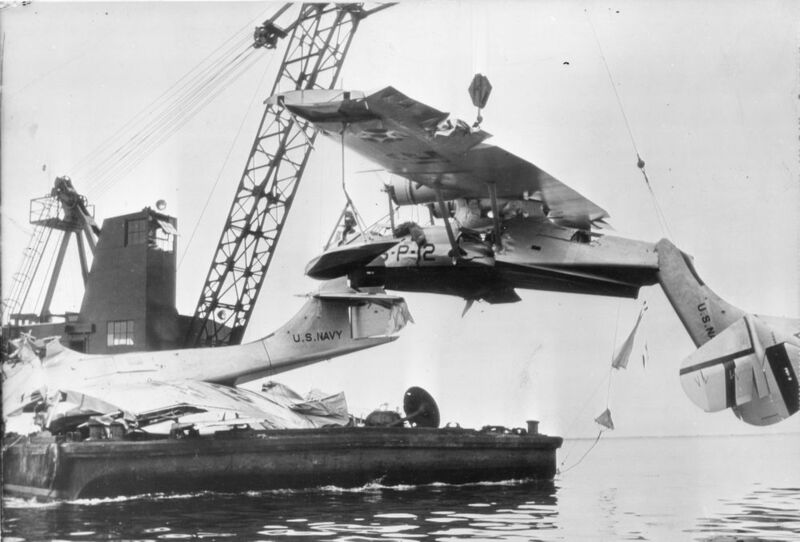 Several boats are gathered around this French Aéronavale Farman F 168 floatplane that has pitched over onto its nose. The two large floats seem to have been ripped out during the landing on water. The aircraft is from squadron 3B1. This bombing group was joined with 3B2 at the naval base on the Etang de Berre in 1928 and later became 3FB only to be reformed as 3B1 again at Port Lyautey in Morocco in 1939. A collision between R.N. Lampo et R.N. Pola, 1938. During an exercise in November 1938, the Italian destroyer Lampo suffered an unfortunate collision when she was rammed by the heavy cruiser Pola. 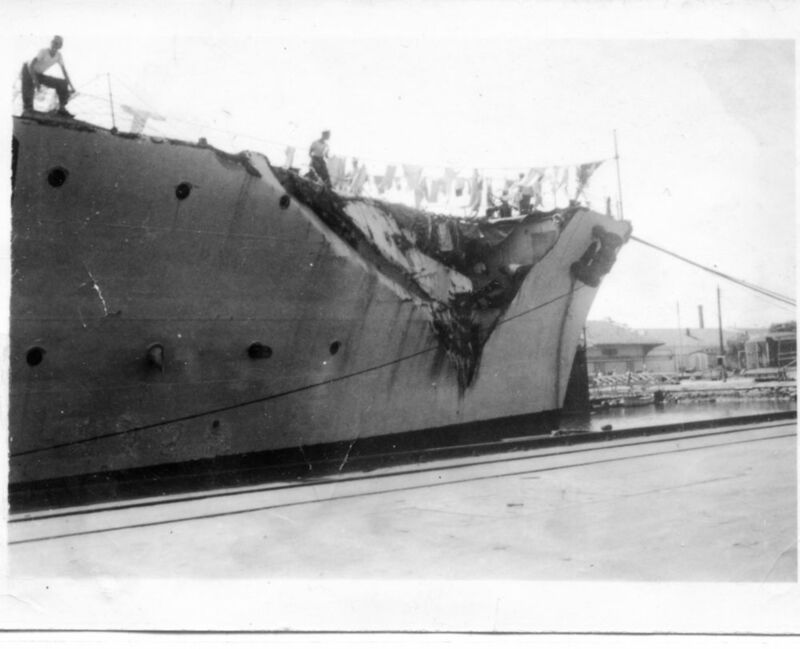 Lampo's bow was destroyed and she lost several members of her crew. She was towed stern first back to port by the tug Tereo and laid up for repairs during the following six months. Russian battleship Parizhskaya Kommuna, off Brest 1929. 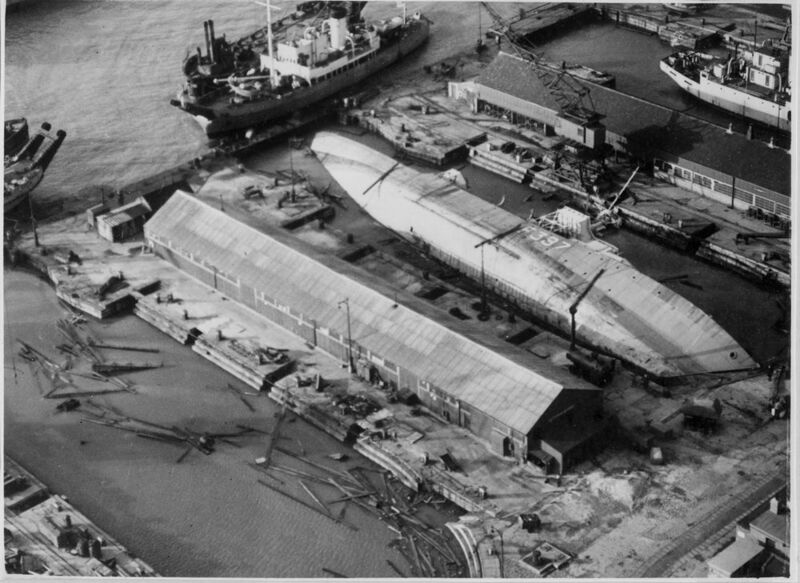 These two photographs clearly show the clipper bow that was added onto the Parizhskaya Kommuna (ex-Sevastopol, completed 1914) during a refit in 1928. Whilst crossing the Bay of Biscay in 1929, the ship ran into a strong storm and water was trapped in the well of the modified bow to the extent that the bow failed. The Parizhskaya Kommuna was in danger of sinking and reluctantly had to put into the port of Brest for repairs. 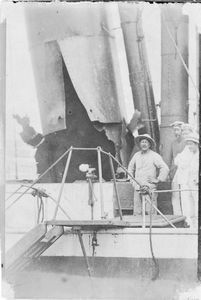 After repairs by the crew, the bow again failed and the ship had to return to Brest but this time repairs were made by a French shipyard. She eventually reached her destination Sevastopol in January 1930. 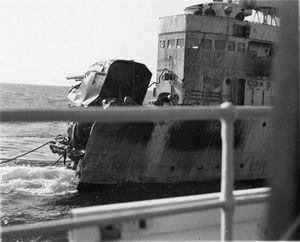 The bow of the " Escorteur rapide " Le Corse was ripped open when, on the 4th July 1973, the "Escorteur d'Escadre" Du Chayla rammed her during exercises in the North Sea. Rather than rebuild the bow, it was decided to replace it with the bow of the Le Bordelais, which was at the time held in reserve. Despite appearances, the joining of the two sections required a high degree of precision. During exercises with Royal Navy cruisers and destroyers off the coast of Spain and with some of her aircraft in the air, the aircraft carrier HMS Glorious was in collision with the three-year-old French liner Florida of the Societe Generale de Transport Maritime à Vapeur. There were banks of fog in the area on 1st April 1931 and the aircraft carrier, after entering a thick fog bank, turned to leave the fog so as to recover her aircraft. However, the manoeuvre was compromised by the presence of the screening cruisers and destroyers. The turn was cancelled and shortly after 9h00, HMS Glorious hit SS Florida just forward of the bridge as she crossed the starboard bow of HMS Glorious. After the collision, the carrier remained in contact with SS Florida and her passengers were transferred to HMS Glorious using improvised gangways. Verso: "A view after Glorious has backed out." in black ink. HMS Glorious prepares to tow SS FLorida. With pumps running and collision mats over part of the hole, HMS Glorious backed out and prepared to tow SS Florida to Gibraltar. 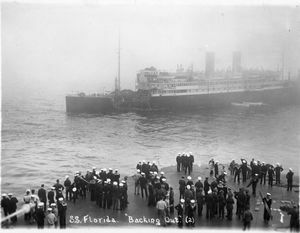 Verso: "Florida showing men from Glorious on board preparing to tow." in black ink. 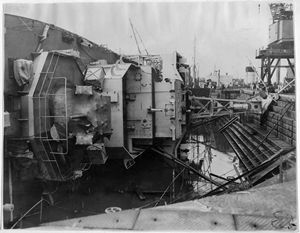 The damaged bow of HMS Glorious. The collision damaged 60 feet of the flying-off deck and here the crew are trying to clear the bow. Reviewing the damage at Gibraltar. Once in the Naval dockyard at Gibraltar, dockyard workers and Naval officers saw what had to be done and made temporary repairs before HMS Glorious sailed on to Malta for permanent repairs. Verso: "H.M.S. Glorious on arrival at Gibraltar" in black ink. On 22nd September 1939, as two Mediterranean convoys crossed one another South of the island of Pantelleria and with all lights extinguished, the passanger ship SS El Djezaïr hit the French Navy contre-torpilleur Vautour at 00h35. 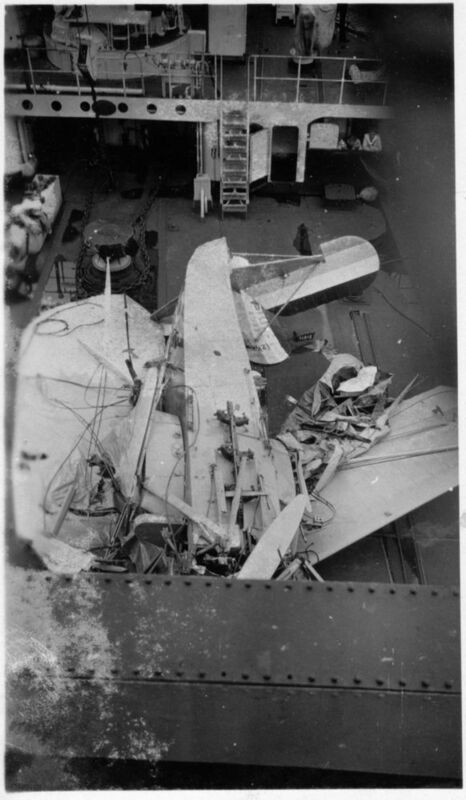 The collision tore a hole above the waterline in the foredeck and hull of the Vautour. These photographs show the Vautour alongside at Bizerte. In the second photograph, it seems to be washing day ! 20030a Verso: "Voila le Vautour avec ses blessures au retour de Beyrouth à son arrivé à Sidi-Abdellah (Bizerte) (1939)." in black ink (Here is the Vautour with its wounds back from Beyrouth arriving in Sidi-Abdella). 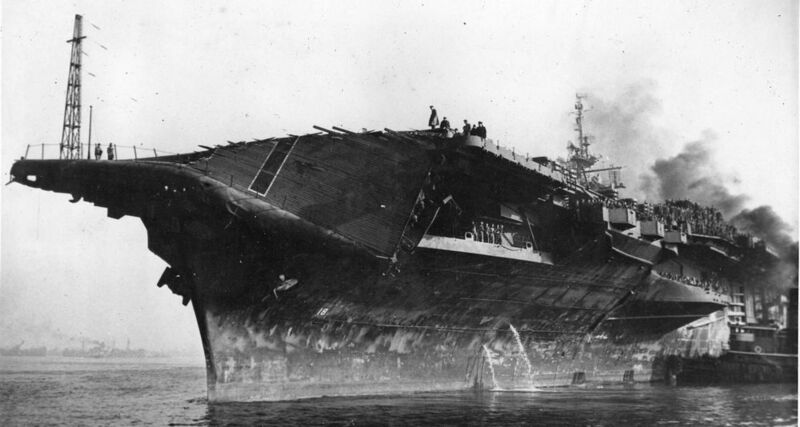 On 25 August 1945, USS Wasp found itself confronting a severe typhoon, with winds reaching 78 kn (140 km/h)and the port overhang was folded down over the bow. 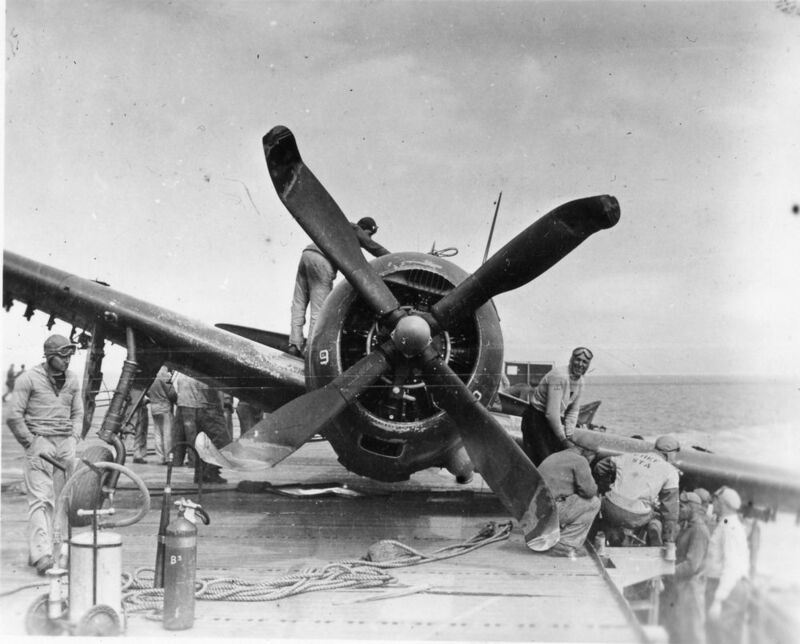 Despite the damage, USS Wasp continued to fly off and receive aircraft. Following this experience, carriers of the Essex class were rebuilt with hurricane bows to reduce the effect of heavy weather. USS Wasp was CV18, see the number 18 on the port bow. A consequence of the great floods of 1952/1953. The winter of 1952-53 was particularly hard, with a severe storm on the night of 31st January/1st February. Coinciding with a high Spring tide coefficient the result was flooding that occurred on the coasts bordering the North Sea. In the dock at Sheerness, the rising tide lifted the main lock gates and the sea rushed in to overwhelm three dry docks. HMS Berkeley Castle F397 (a Castle-class corvette completed in 1943) and HMS Sirdar (an S-class submarine completed in 1943) were each in dry dock undergoing refits after coming out of reserve (see mothballed gun turret on the foredeck of HMS Berkeley Castle). The wooden shores holding the ship upright were washed away and she keeled over onto the port side with the mast hitting the side of the dry dock. 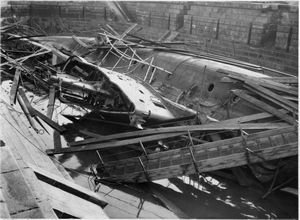 The submarine was likewise engulfed by the incoming sea and sank in the dry dock. 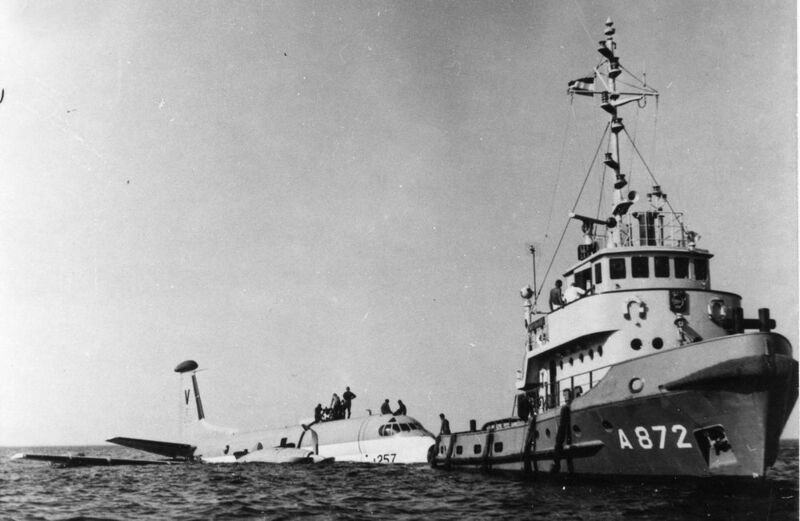 Both vessels were later refloated and repaired. Top Verso "Berkeley Castle" in blue crayon. Collision and grounding of HMS Gladiator. 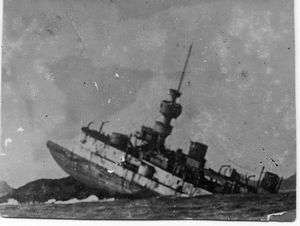 These two photographs show HMS Gladiator (an Arrogant-class cruiser) over on her side and resting on the seabed off the Isle of Wight after being hit a glancing blow by the American steamer SS Saint Paul. 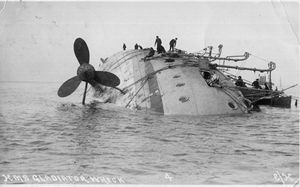 The weather was bad on 25th April 1908 as HMS Gladiator was heading up the Western passage of the Solent with visibility down to 800 yds. 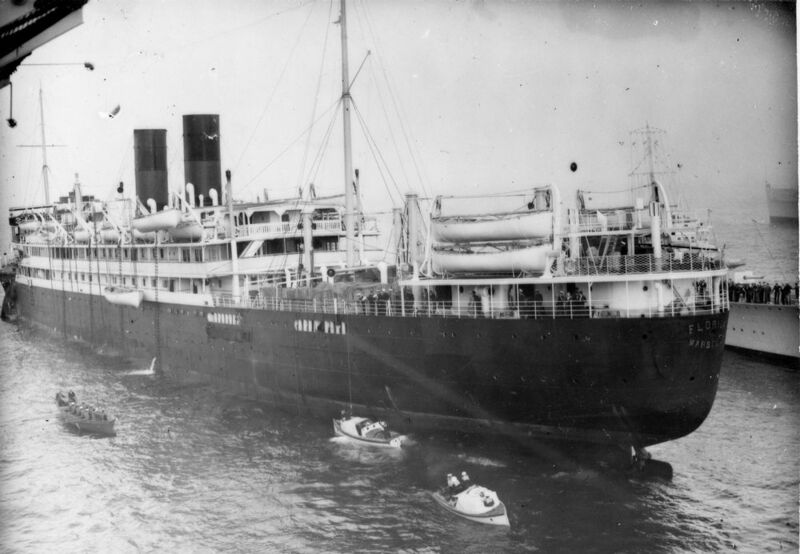 Both the outbound SS Saint Paul and the inbound HMS Gladiator had to maintain speed to assure good steerage in the face of strong tides and gale force winds. The distance between the Isle of Wight and Hurst Point on the mainland is about 1000 yds and the standard crossing procedure of port to port was in application but, lacking sea room to manoeuvre, HMS Gladiator turned towards SS Saint Paul and in the inevitable collision, the steamer struck HMS Gladiator just aft of her engine room ripping open the hull. HMS Gladiator was salvaged at great cost then, being obsolete, she was sold for scrap with a considerable loss of money. 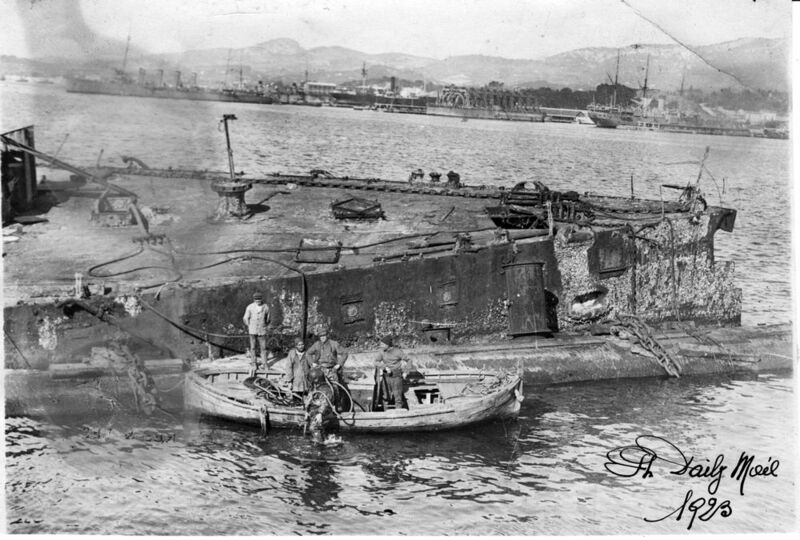 HMS Gladiator before being righted. During the time that HMS Gladiator was aground, she became a major tourist attraction being close to the coast and in this photograph we can see spectators being rowed around the wreck. 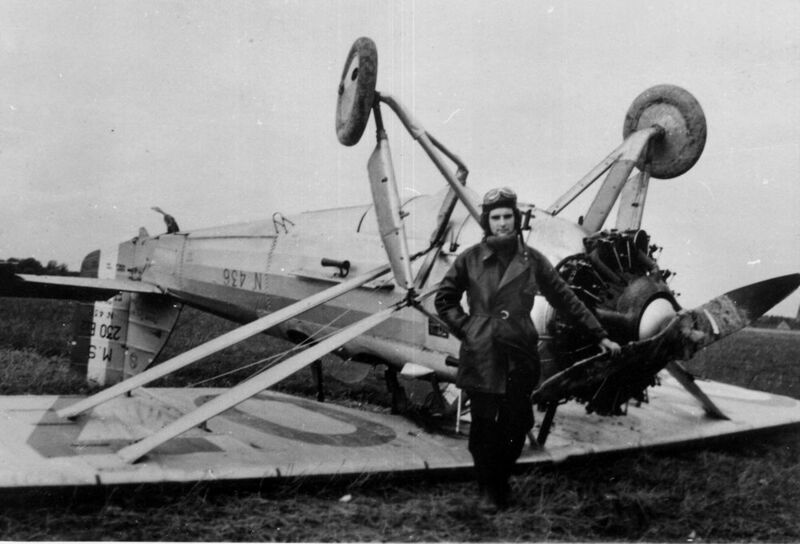 Morane Saulnier N-436 flipped over, 1939. Even if this is not a Naval subject, the story is good. This proud young pilot stands in front of his upturned Morane-Saulnier MS-230 almost in defiance of the accident that has just occurred. From the registration number N 436 and with the powers of Internet, it has been possible to trace the story of this photograph. The pilot is Corporal Bernard de Joybert, trainee pilot in the French Air Force. On 6th November 1939, when coming in to land at the airfield of Evreux-Fauville, he came in short of the runway, hit a pathway at the edge of the airfield and flipped over the aircraft. Apparently unhurt this time, his luck ran out when he was killed on active service on 1st December 1939 at the age of 22. Naval Aircraft Factory PN-9, 1925. The US Navy was interested in developing long-range flying boats to patrol far out into the Pacific and Atlantic oceans. The Naval Aircraft Factory converted one of the PN-8 flying boats to a PN-9 with redesigned tail surfaces and different engine nacelles. This aircraft was used in an attempt to fly from San Francisco Bay to Hawaii, crossing 2,400 miles of ocean, but ran out of fuel some 559 miles away from Hawaii. Undeterred, the crew of five set about making sails from the lower wing fabric and began to sail the flying boat to Hawaii. 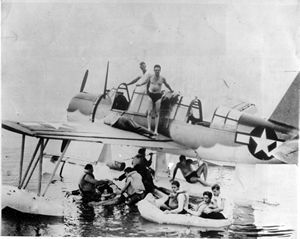 Fortunately, after being adrift for ten days, the PN-9 was spotted by the US Navy submarine R-4 which rescued the crew of five and towed the flying boat to the port of Nawiliwili on the island of Kauai. Verso : "First actual photos of lost Navy fliers. Honolulu. Photo shows the Navy plane PN-9-1, at anchor in the harbour of Nawiliwili, to which port the plane was towed by the submarine R-4, which rescued the fliers on September 10th. The five fliers were given up for lost, but themselves never gave up hopes of being rescued. 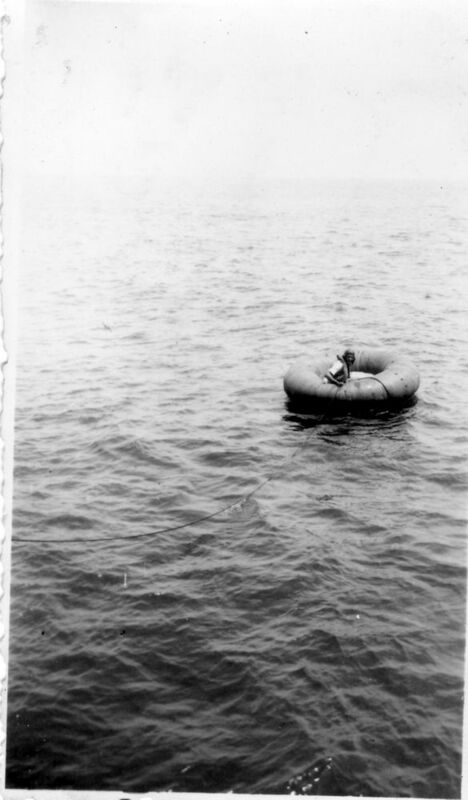 They were adrift for ten days in the Pacific/ 9-21-25". In September 1944, a powerful tropical cyclone that was later called the Great Atlantic Hurricane hit the East coast of the USA, reaching its peak on 13th September. Several ships of the US Navy sank during the storm as waves reached 21 metres in height. 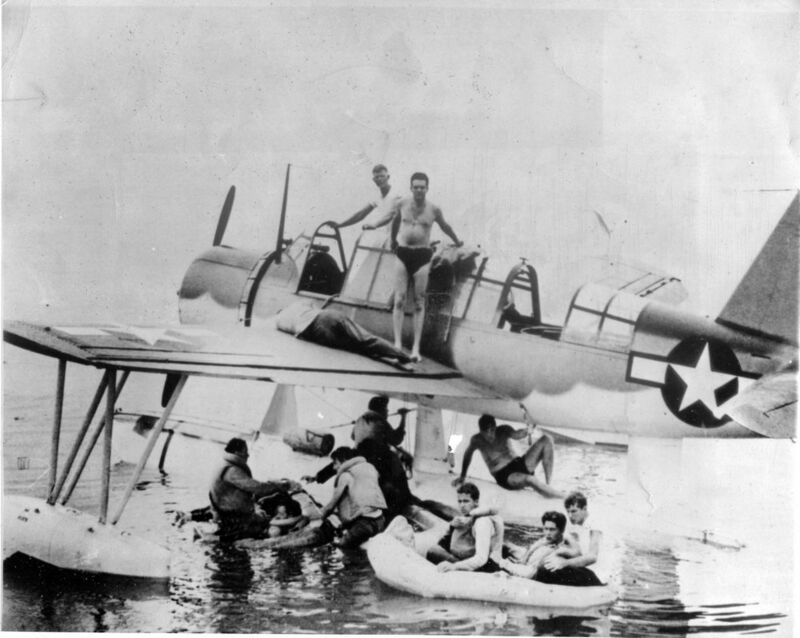 Two US Coast Guard cutters USCG Jackson and USCG Beldloe sank and this photograph shows eleven survivors of the two ships, as well as the pilot and the navigator, hanging on to one of the three Vought-OS2U Kingfishers which went out in search of the lost seamen. 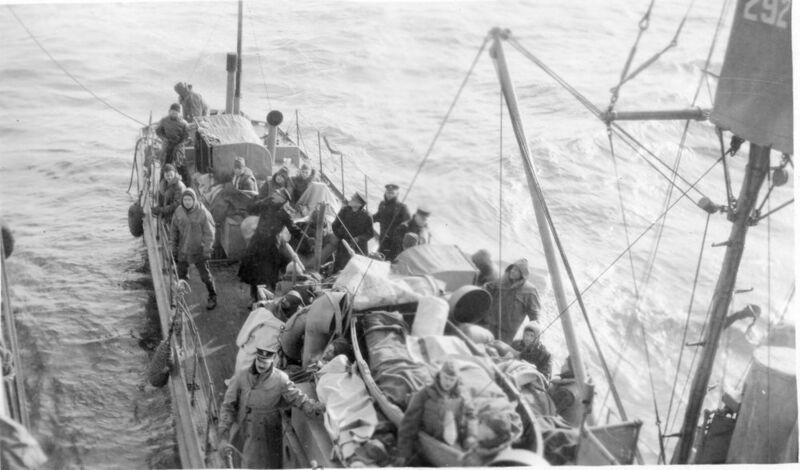 After giving the location by radio, the survivors were transferred to a Navy ship. 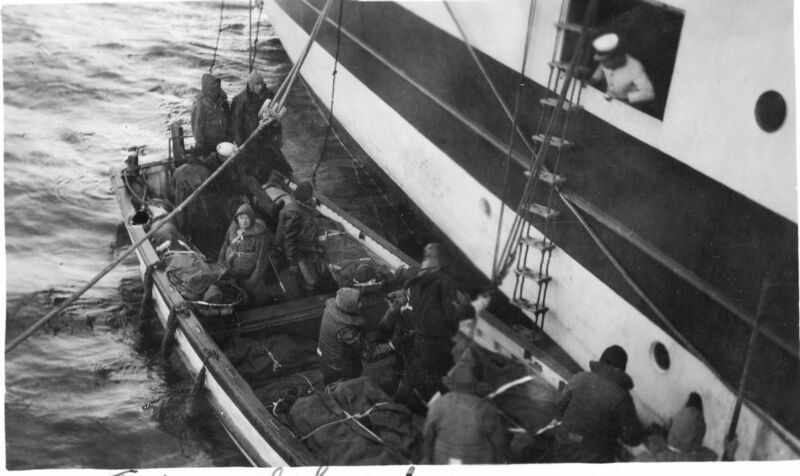 Verso: "Coast Guard patrol plane sheltering survivors of Coast Guard cutter Jackson which sank in the Great Atlantic Hurricane, Sept. 14, 1944. Survivors of the Coast Guard Cutters Jackson and Bedloe climb aboard the wings of the Navy sea plane that sighted them after three days adrift at sea when their cutters sank in the Great Atlantic Hurricane of 1944." The Consolidated PBY Catalina flying boat was a successful patrol and bomber aircraft used by the US Navy. By mid-1938, there were 14 squadrons flying this type and by the end of the war over 3000 PBY had been built. The rapid introduction of this aircraft was followed by the inevitable increase in accidents and in this photograph we can see the wrecks of two Catalinas that collided during a formation landing at night. 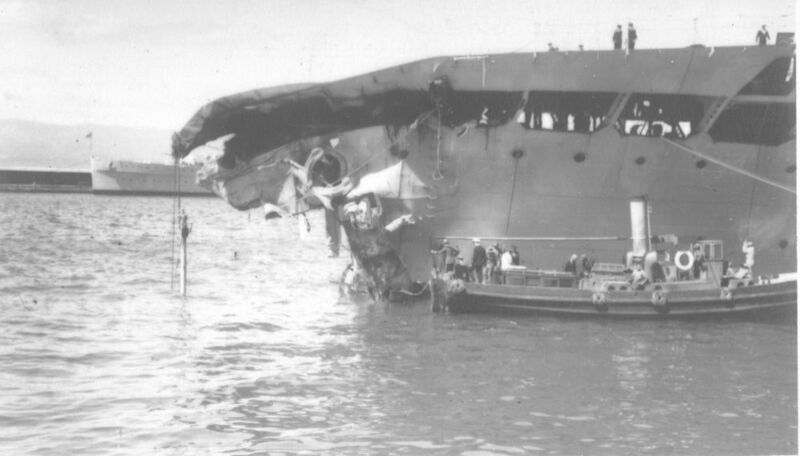 Four crew members were killed in this incident and the previous day another Catalina had crashed into the sea off San Diego. Recto: "San Diego, Cal., Aug. 16 - Navy planes crash in bay - Shortly after a sister-ship had crashed near here yesterday, two more Navy bombing planes plummeted into San Diego bay, bringing death total to seven, with one injured for the three crashes. 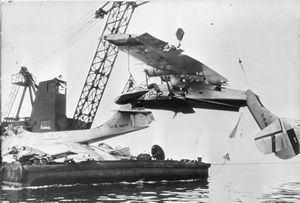 Shown above on crane, is plane in which the flyers were killed and on barge platform is wreckage of plane from which crew escaped. Verso: "29 AUG 1938" red ink rubber stamp. 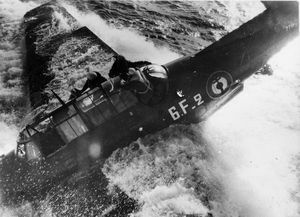 A Breguet Atlantic ditches, 1973. On 15th August 1973 a Bréguet SP 13A Atlantic 257 of the Royal Netherlands Navy ditched just off the coast, 1.5km West of Wassenaar in the Netherlands. 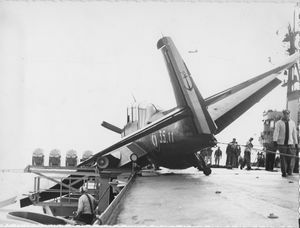 With a faulty elevator control, the crew considered it too risky to attempt a landing at the Valkenburg Naval air base and decided to make a controlled ditching. The crew were quickly recovered and the aircraft was towed by the Naval tug Waddenzee to Den Helder where it was declared a write-off being damaged beyond repair. There were no casualties amongst the 14 crew. A similar accident, again due to a problem of elevator control, occurred on 18th January 1981. 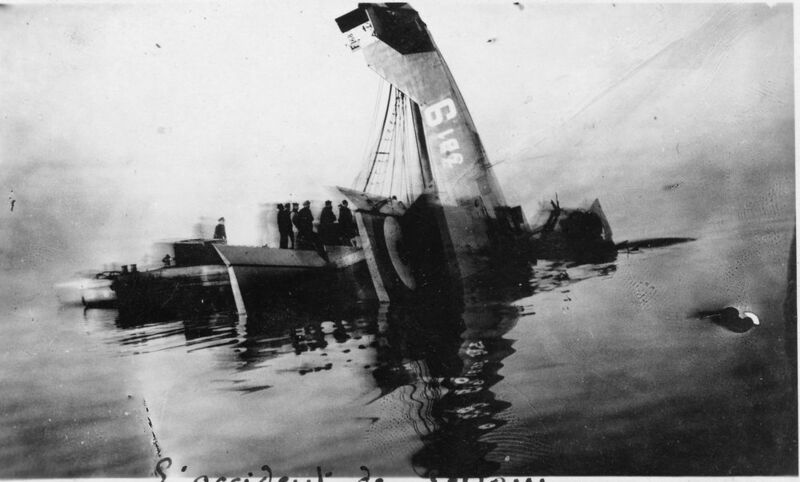 During the ditching, the aircraft broke-up and not all the crew were able to reach the life rafts, three died. Recovering a crashed Levasseur PL-4. The Levasseur PL-4 was a reconnaissance/spotter biplane that operated from the aircraft carrier Béarn in the 1920s. This aircraft has come to grief and is being lifted on board the Béarn. Several features were incorporated in the design of the PL-4 to facilitate ditching at sea and we can see some of them here. No undercarriage is visible because it and tail skid could be jettisoned prior to ditching and the underside of the fuselage has a boat-like form. We can also see the small floats attached to the underside of the lower wing, the starboard lower wing has been folded back and the float is just by the roundel. The port float can be seen just under the gangway. Austro-Hungarian Navy torpedo boat Csepel, 1916. The Tatra-class destroyer Csepel was hit in the stern by a torpedo from the French submarine Bernouilli on 4th May 1916 off Brindisi. The explosion ripped the quarter deck back as far as the engine room. 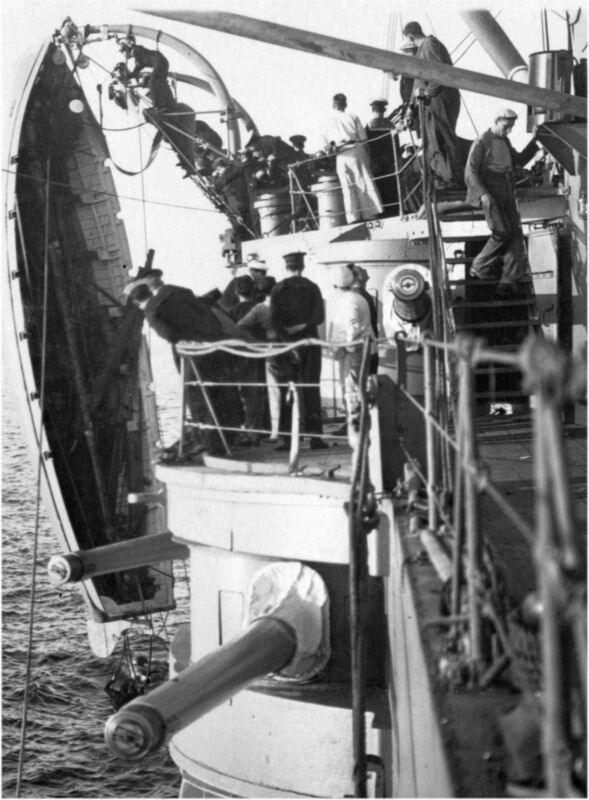 As luck would have it, the loaded and armed twin torpedo mounting was thrown forward onto the deckhouse without exploding, we can see the warheads of the two torpedoes to the upper right of the photograph. The damaged ship was patched up at Kotor then towed to Fiume and then on to Porto Re where a new stern section was fitted. Verso: "Csepel Toryadatrapper (sic)" in pencil. 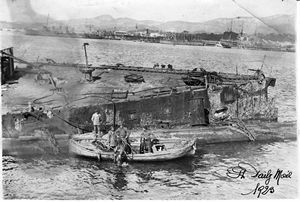 The wreck of the French battleship Liberté, 1923. The French pre-dreadnought battleship Liberté blew up and sank in the Toulon Naval base on 25th September 1911. The cause was the spontaneous ignition of unstable nitrocellulose propellant in a forward magazine which then set-off explosions in the other magazines. The deck was peeled back from the midline back towards the rear turret. 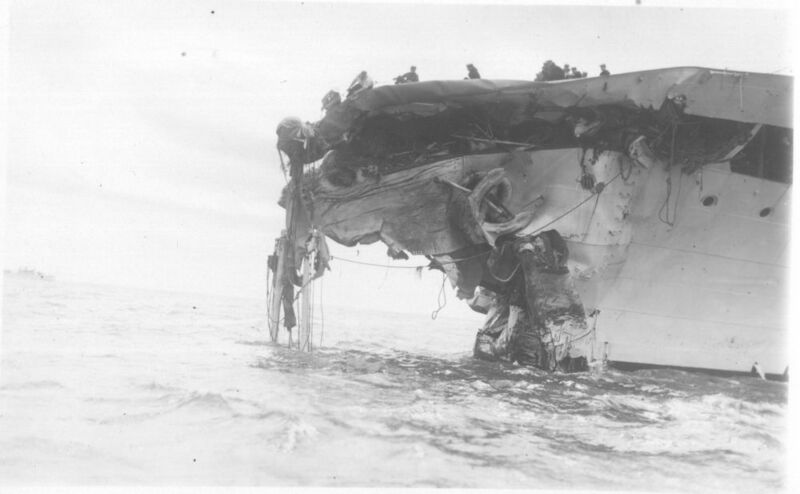 Contemporary photographs show the extent of the damage with a 7.6-inch turret suspended upside down. The wreck sank well within the naval base and became a hazard to shipping. This photograph from 1923 shows a diver working around the stern of the Liberté prior to raising the ship in 1925 and scrapping it. Verso: "Recherché sur le Liberté. Detruit en 1911" in blue ink. Verso: "Fighter on rocket launcher and plane just landing" in blue ink. 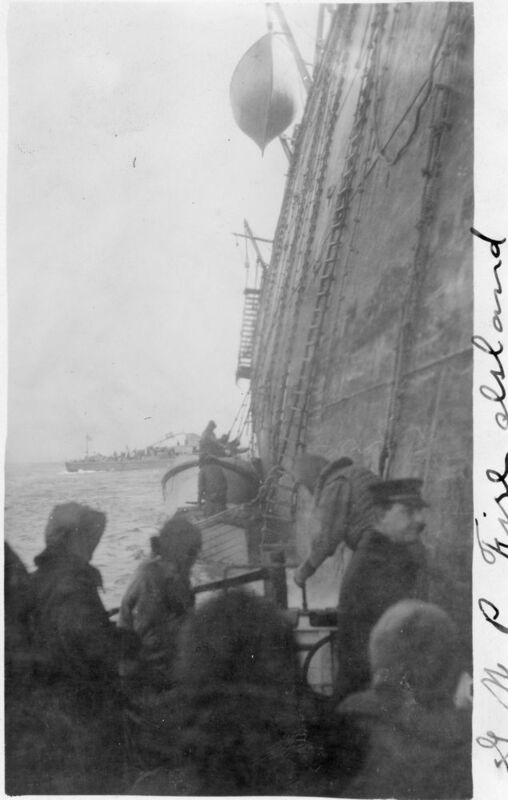 The grounding and evacuation of SS Northern Pacific, 1919. The USAT Northern Pacific went aground on a sandbar off Fire Island, New York on 1st January 1919 whilst bringing back about 2,500 US troops from France. 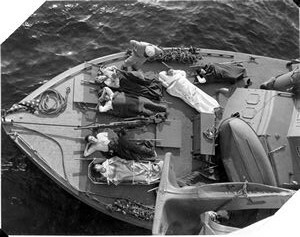 The passengers included many sick and wounded men. As the storm intensified pushing USAT Northern Pacific further onto the sandbar, the stranded soldiers began to be evacuated by submarine chasers and small boats moving between the Northern Pacific and larger US Navy ships, including the hospital ship USS Solace, lying off the stranded vessel. The ship was floated off the sandbar on 18th January and towed to New York harbour. Here we can see Jacob's ladders in place over the side of SS Northern Pacific with small boats alongside. USS Submarine chaser 292 evacuates stretcher cases. The wounded were taken off on 3rd and 4th January by a fleet of four submarine chasers, including SC-292 seen in this photograph, and small boats ferrying the men to the transport ship Henry R. Mallory and the hospital ship Solace, both standing by offshore. USS Hospital ship Solace taking on the wounded. Once alongside USS Solace, the stretcher cases were lifted up and swung onto the deck of the hospital ship. A French Navy Avenger almost goes over the side. It looks as though the port undercarriage of this Grumman T.B.M. 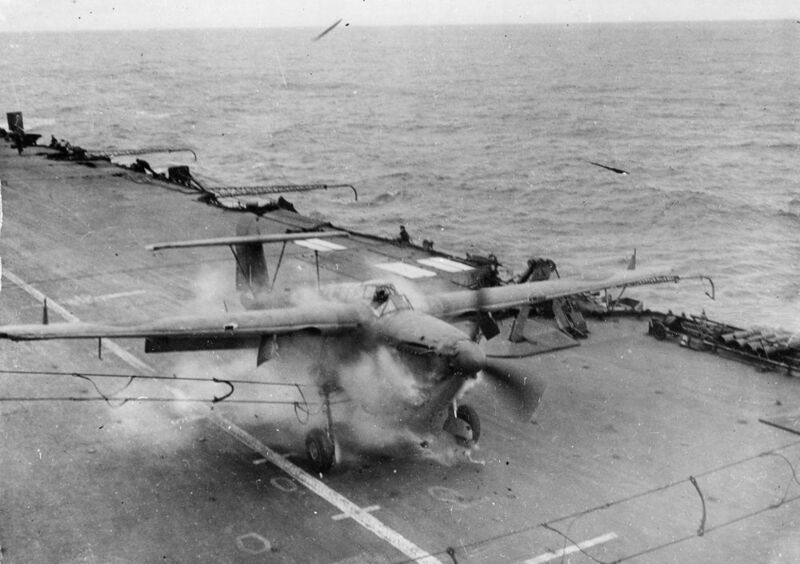 Avenger has given way on landing and the aircraft has skewed to port and almost slipped off the flight deck. This Avenger, TBM 69442, was transferred to the Royal Navy in 1958 and then on to the French Navy in March 1958 to be struck off in December 1963. The aircraft carrier is the Arromanches and we can see a Piasecki HUP-2 in the background to the right of the tail. Handling the cutter goes wrong. Here's an unfortunate mishap! The stern fall has come away, tipping the cutter over by the stern and apparently throwing a man into the sea. He can be seen hanging on to ropes just below the cutter's rudder. 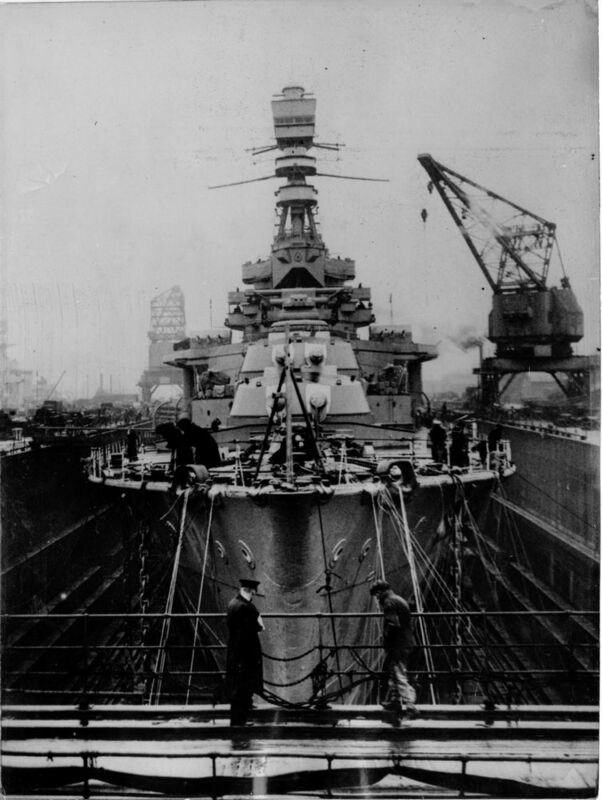 Whilst some men watch the poor chap in the water, others are up on the davit trying to remediate the situation on this Royal Navy battleship sometime around the Second World War. A curtiss SB2C Helldiver in trouble. 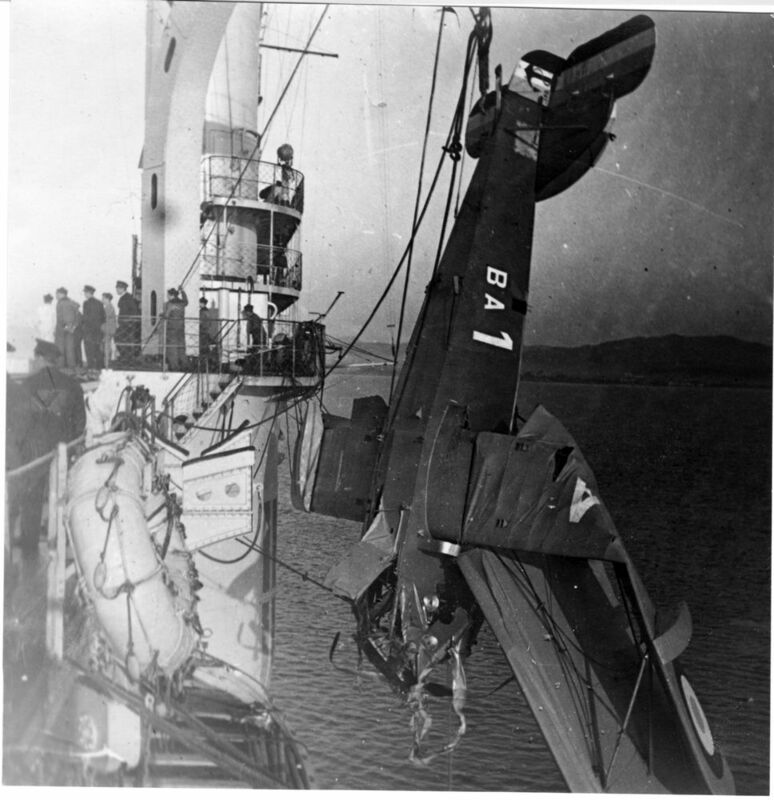 This time it is a French Aéronavale Curtiss Helldiver that has gone over the edge of the flight deck, was it a hard deck landing and the port undercarriage gave way or just the result of the poor handling characteristics at slow speeds attributed to the Helldiver? We can see the starboard wing racks for bomb or rockets. 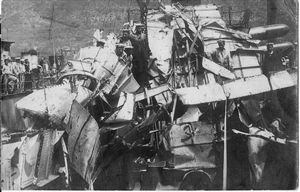 Wrecked seaplane on the Commandant Teste. 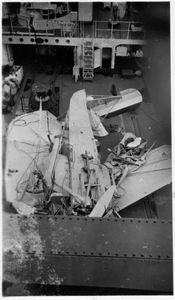 Not much is left of this floatplane fished out of the sea by the French seaplane carrier Commandant Teste some time before 1939. Elements to identify the aircraft as a Levasseur PL14/PL15 are the struts on tailplane and two thin diagonal struts between the main wings, rounded tips to rudder, torpedo claps and part of the three-bladed fine-profiled screw appears in the centre of the photograph. Captured British pilot, Dakar 1940. Here is a British pilot in rather a sticky situation. In an attempt to rally the Vichy French forces to the Allied cause, a combined Free French and Royal Navy force approached the port of Dakar with the aim of landing troops. However, they received a hot reception and the mission was called off after a brief two-day engagement. The photograph shows Vichy French forces recovering a British airman after being shot down. In "A History of the Mediterranean Air War, 1940-1945 (Shores and Massimello), two Skuas and five Swordfish are given as being lost during the aerial attacks on Dakar harbour. Five crew were taken prisoner of which G.P. Dawson and D.G. Richardson were each the sole survivor of their aircraft, this photograph is probably one of the two. A bad landing at the Fréjus training school. A base for the French Aéronavale has existed at Fréjus-Saint Raphael since the early 1900s and served as a training base for naval pilots. Here a biplane has hit the hangar after a "bad landing" as the French text says! The aircraft is difficult to identify but other photographs from the same series show Sopwith biplanes at the base in the early 1920s. More than just a mishap. Numerous stretcher cases are spread around the foredeck of PT 210 and for these wounded sailors the war is probably over. PT 210, a 78-foot Higgins motor torpedo boat of the US Navy, was part of the MTB squadron sent to the Mediterranean and integrated into the British Coastal Forces. It was in action during the Allied landings at Saint Tropez in 1944 and is seen here ferrying wounded sailors out to a hospital ship. The sailor top right has been given a stock of Lucky Strike cigarettes. 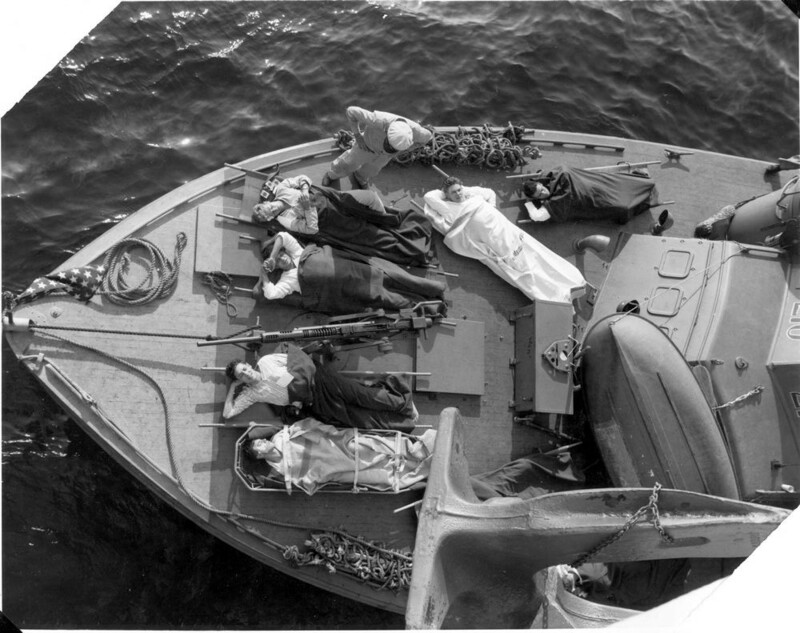 Verso: "Transfer of wounded sailors aboard a PT boat to be carried to a hospital ship off Southern coast of France. 16 Aug 1944"